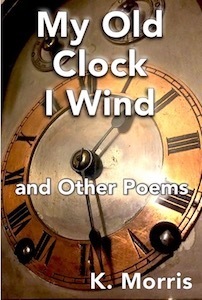 A collection of 74 new and original poems. It contains both melancholy and more cheerful pieces contrasting the fact that We can enjoy life but at the same time cannot escape the inevitable end. By now, we are all very aware of the regard with which I hold K. Morris’ poetry. At this point, it feels like a stationary point in the world that I keep getting drawn back to. Each collection he writes is expertly crafted, not just in the poems – that never fail to touch my emotions – but the order. Reading a K. Morris collection of poetry is like embarking on a journey, a novel in its own right. Early last year, I listened to a Poetry CD by K. Morris, which I loved. I thought each poem was brought to life by Morris’ narration, as though the meaning was underscored by his voice, the nuances highlighted, and the whole experience in general amplified. This audiobook, however, was not read by Morris, and I think that took away from the experience. What I found moving and personal in Morris’ poetry CD seemed a lot colder and clinical in this audiobook, which is truly unfortunate. Regardless, I still really enjoyed this poetry collection, and I highly recommend you pick it up, even if I didn’t particularly enjoy the narration.